Eagle-Vail’s Mikaela Shiffrin claims overall slalom title (Getty Images/Agence Zoom – Nisse Schmidt). Eagle-Vail Olympic gold medalist Mikaela Shiffrin won her fourth World Cup slalom race of the season Saturday in Are, Sweden, to clinch a second straight World Cup title in the discipline. The 18-year-old who turns 19 next week became the youngest woman to reach eight World Cup slalom wins. The first win of Shiffrin’s career came less than two years ago on Dec. 20, 2012, in Are, and now the Burke Mountain Academy graduate ranks all alone in fourth on the all time victory list by American women. Only Vail’s Lindsey Vonn (59), Tamara McKinney (18) and Picabo Street (9) have more wins on the World Cup tour. Shiffrin is also the youngest Olympic and world champion ever in slalom. Shiffrin then remembered a special moment that happened after that first win. “When I came to do my first press conference everyone was so nice and I met this little girl right outside,” Shiffrin said. “She was really young and she had leukemia. Her mom just said, ‘Do you think you could take a picture with her. It would really make her day.’ I just keep thinking about that, like she was a little lucky charm for me for some reason. Shiffrin opened a .66 gap on the field in the first run despite stormy weather. She then held on to the lead to win by .60 over Maria Pietilae-Holmer of Sweden. Anna Swenn-Larsson, also of Sweden, was third for the first World Cup podium of her career. 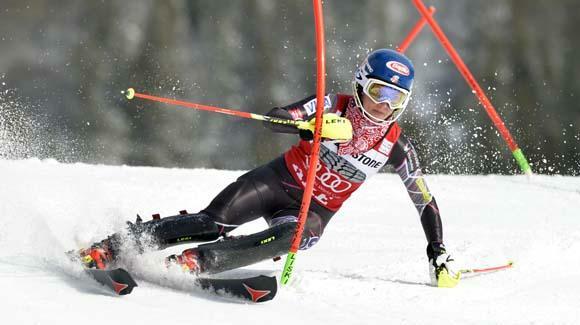 Shiffrin mathematically clinched her second straight season slalom title. Frida Hansdotter of Sweden was the only other athlete in the title hunt and was second after the first run, but she finished fourth to hand the title to Shiffrin before the final race of the season. Shiffrin finished fifth in GS at last month’s Sochi Olympics and climbed on a GS podium at Beaver Creek in December. “She’s very comfortable in slalom. That’s her domain,” U.S. Ski Team Women’s Technical Head Coach Roland Pfeifer said. “I just go day by day and hope I can do a good job. It makes me a little bit proud and I must be doing something right with Mikaela. We’re all still thinking about what’s going to be her future. Also Saturday, double Olympic gold medalist Ted Ligety, of Park City, Utah, captured a record sixth giant slalom victory in Kranjska Gora, Slovenia, to become the first man in World Cup history to have won six times at the same venue. The 23rd win of his career also moved Ligety within 50 points of Austrian Marcel Hirscher, who finished fourth, for the 2014 World Cup giant slalom title. The title will be decided March 15 at the World Cup Finals in Lenzerheide, Switzerland.